This is a breakdown of a quick illustration technique I have used to compose some smaller SketchUp models. The project shown is of a quick semester warm-up exercise from school where only visuals and no physical models were required. Since the project was quite small, I constructed the model atop what looks like a diorama base to give the building the look as if it is an actual model. 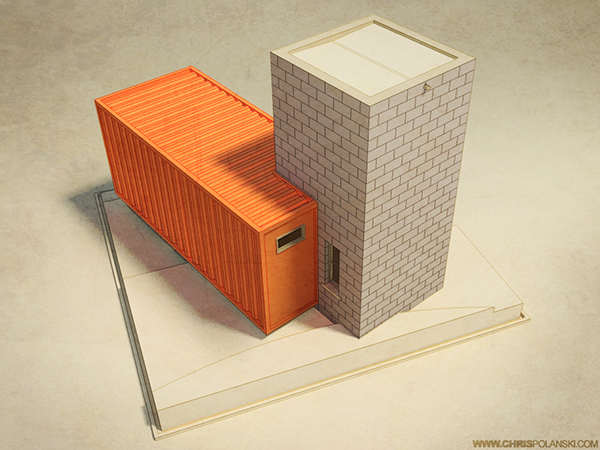 Only three colors were applied to the entire model – orange for the shipping container, gray for the block and tan for everything else. In the end this became a technique I would use again to put together very quick faux basswood model visuals in a fraction of the time it would take to physically build one. While nothing can replace the ability to pick up, examine and critique a real world model, a collection of several perspectives of a project presented like this worked in a pinch. 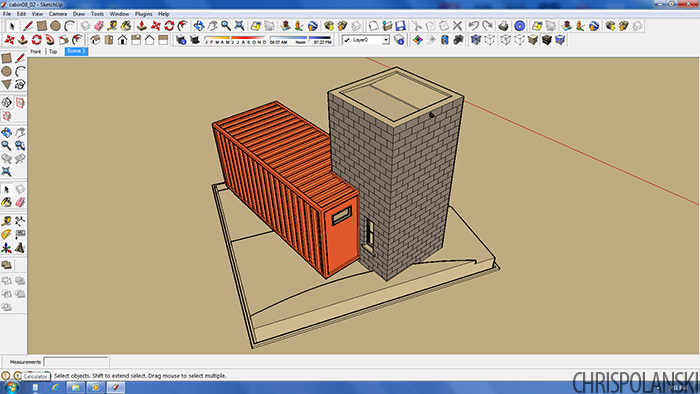 The image below is a capture of the final SketchUp model. 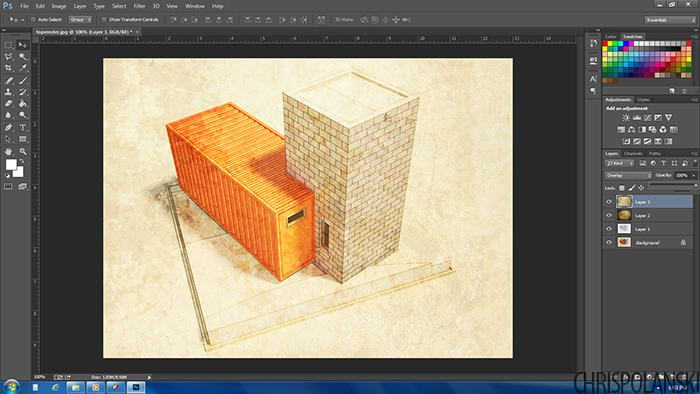 It’s a fairly simple construction, with the only real detail being the shipping container. Since the project was site-less, I situated the cabin on a square base to give the building an appearance of being an actual model. While this technique doesn’t always work with larger projects, I’ve found it quite useful with smaller buildings. I’ll note here that when using this technique I typically don’t include any glass or translucent materials. They can take away from the modeled look and also drastically increase renderings times. 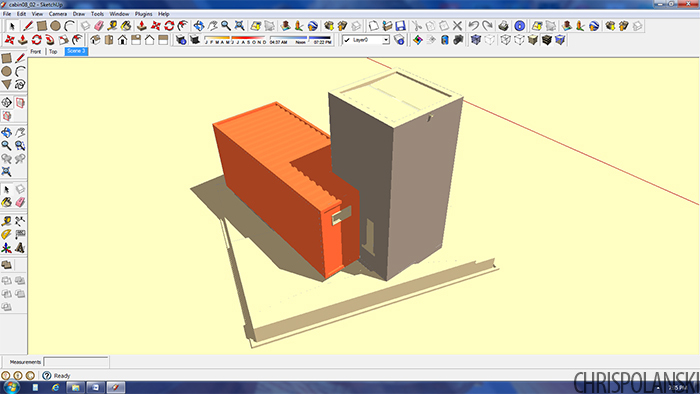 As mentioned above only three colors were used, all applied in SketchUp. I’ve also locked in the view using the Scene tool since the final composition will consist of two images layered in Photoshop. Once the view is locked I turned profiles ‘off’ under the Edge Style menu as shown above. Then I changed the Face Style to ‘monochrome’ and, making sure shadows are turned off, export the image as a jpeg under the File > Export menu. For my image I turned the sun back on and used Kerkythea to render the color and shadows; however you could directly export the view with all linework off and shadows on, as shown below. I prefer use a rendering engine such as Kerkythea because it tends to soften the image a bit and renders the shadows much more realistically. 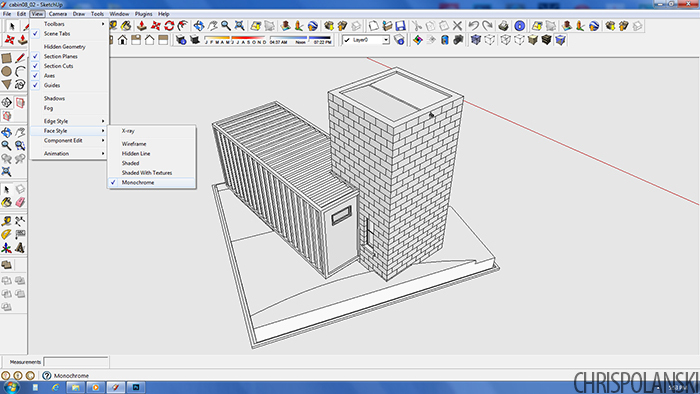 It also distances the image from the typical SketchUp look. Once the two images are saved, it’s time to move to Photoshop. 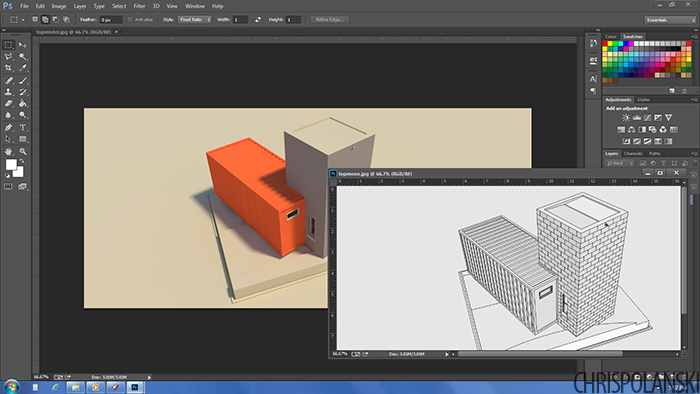 You should have two images similar to those shown below – one with colors and shadows and another with linework. Pull the linework on top of the rendering, set the layer to ‘overlay” and turn down the opacity. For this image the linework is at about 50% opacity. I also added a few layers of grime on top of the composition to give the final image a little texture and color variation. Just perform an image search for ‘grime’ or ‘grunge’ and many images will pop up. These two layers were also set to ‘overlay’ and the opacity was turned down much lower – this time to only about 15%. The image above shows the second grime layer before the opacity was turned down. Above is the final image. Besides the actual construction of the model in SketchUp, the image was composed in less than 10 minutes, including rendering the model in Kerkythea and playing around with layer opacities until I found a look that appealed to me. 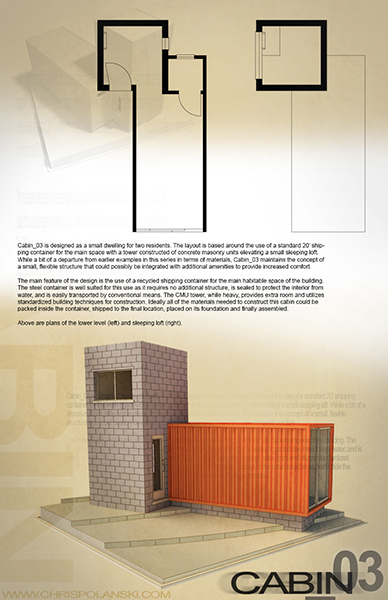 Below is the final poster for this cabin after a few images were compiled together with plans and text to give an outline of the entire project. The view broken down here can be seen faintly in the top left corner.